The Ministry of Infrastructure of Ukraine is considering the transfer of the Kyiv central railway station to concession. "We are considering the possibility of transferring the station to concession. This could be a municipal concession if the city has money, maybe a private investor," Infrastructure Minister Volodymyr Omelyan said on Facebook. 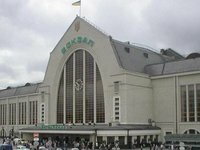 The minister noted that the station accepts about 100,000 passengers every day, but its general condition, as well as the state of the station square "do not correspond to the honorary title of the Kyiv architectural landmark." "We've agreed to turn this object into a modern, tidy, comfortable and safe public space. In two weeks we will gather, analyze proposals from the Ministry of Infrastructure, Ukrzaliznytsia, the National Police and the Kyiv mayor's office. Trading platforms, waiting rooms, parking lots - all this should be put in order, in a single aesthetic style," Omelyan said.